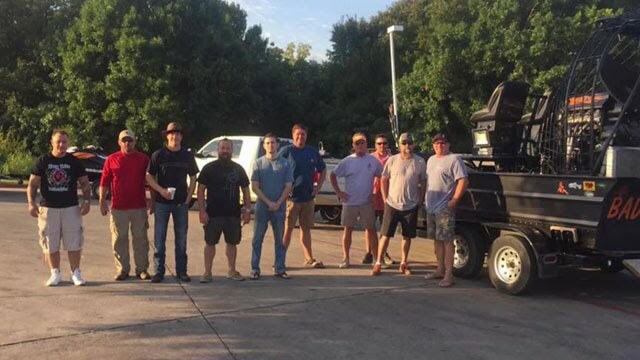 A dozen volunteers from Texoma -- along with their boats and personal watercraft -- are traveling to the Texas Gulf Coast. Their mission: To help with rescue and recovery efforts in the flood disaster zone. "It's just another adventure in my life, it's what I like," said volunteer Norman O'Neal. "And to help people like this, it's gonna be awesome. I love it... I can't wait." American Red Cross Texoma Chapter chairwoman Sara Jerome helped assemble the group of 12 volunteers, who began their journey of mercy after buying supplies. "So people are donating, we've had people load groceries, we've had people walk by and give us cash," she said. "It's amazing what people want to do to help, It's heartwarming." So how does the generosity affect the people of Texoma? "Makes me cry, it gives you a lot of positive things for humanity. You can see the good in people when something like this comes out." And Norman O'Neal pledges to provide assistance as long as he and his boat are needed. "I'm really looking forward to it, and I don't care how long I have to stay, I'm just gonna go down there and help. I enjoy it."